Published on November 18, 2013 November 18, 2013 by Jennifer S.
Amazing does not quite adequately describe this day. We got on the bus (special shoutout to my seatmate, Eric Zachs) and headed toward Masada. Along the way we got to see several settlements. The difference between the Palestinian and Israeli settlements is quite stark. It is really a difference of cleanliness. The first thing that came to mind is the difference between Capitol Ave. at the West Hartford border, and Boulevard just across Prospect. It’s much more extreme, though. We drove through one Israeli settlement that is entirely gated. On our way to our first stop, we passed the location where the first Dead Sea scroll was found. 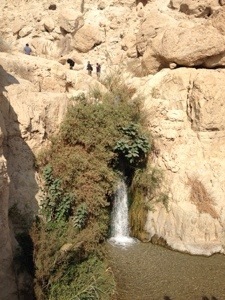 At the En Gedi Nature Reserve we got out of the bus and went for a hike. I think I can safely say I’ve never seen scenery like that before. The mountains and the Dead Sea are, quite simply, breathtaking. I even got to see a mountain goat! Unfortunately, most of the good photos are on my real camera, not my smartphone. And it got better. 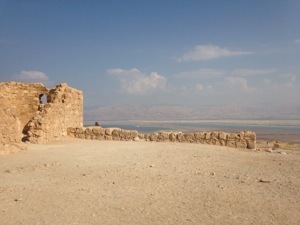 We were then off to Masada National Park. You have two options there; you can either climb the mountain, or take the cable car. Nine of us decided to do the climb. Though I do not usually mention names, Jessica Zachs, Scott MacGilpin, and I were quite proud to make it to the top in 33 minutes. Most of the rest of the group took an additional half hour. It was exhilarating, and the views were stunning. 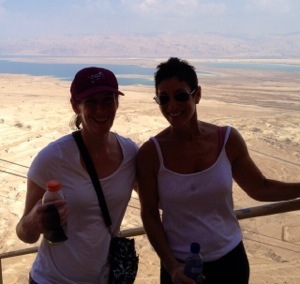 Jessica and I, about to summit Masada. Then it was time to go swimming in the Dead Sea, the lowest place on earth. You don’t have to try to stay afloat, you just do. After walking in, you sit back as if you were going to sit in an arm chair. The next thing you know, your feet are hovering above the water. I did get some in my mouth (blech) and in my eye (a bit of a sting), but nothing I couldn’t deal with. Putting on mud was fun, and my skin does feel great now. About a year ago I was having a discussion about Israel. Someone asked if I were interested in taking a trip here. At the time I was ambivalent. After today, I have quite certainly lost my ambivalence.